The third evolution of the Frontier series from Hawke Optics, the latest Hawke Frontier ED X series offers you the choice of either an 8x42 or 10x42 configuration, with each available in either a green or grey finish. A major difference between the older Frontier ED series (see image on right below) and this new Frontier ED X range (image below left) is that Hawke has changed the body from an open bridge to a single top hinge design. Both of these designs have their advantages over each other, so in many cases it can boil down to personal preferences and quite often that is simply a case of which one you prefer the look of. What I can say is whilst the gap between the bridges in the previous model made for a secure way to hold onto the instrument when carrying it one handed, the Frontier ED X not only looks, but is substantially shorter (1 inch) and is overall a much more compact binocular. As I mentioned earlier, this and the 10x42 versions come in either this grey or a green rubber armor exterior. The rubber that Hawke Optics have used is quite thin and thus will not offer as much protection from impacts as thicker more cushioned rubber armors. However this is countered by the fact that in my experience harder rubbers like this are less prone to perishing and are less likely to move about over the chassis below. Indeed the armor on my sample had an extremely tight fit and thus I would say there is almost no chance of this happening though normal use. Softer rubbers also tend to naturally offer up more grip, although the fine texture imprinted into the surface on these I think more than makes up for this. It also makes the surface a little less reflective, which if you need to be as stealthy as possible can be an important aspect to keep in mind. Under the rubber armor exterior, these Hawke Frontier 8x42 ED X Binoculars have a magnesium alloy frame contains and provides protection to the optics and mechanisms contained within. Whilst it is more expensive to make and a little heavier than polycarbonate ones, it is undoubtably stronger. It is also my understanding that magnesium is more resistant to temperature related expansion and contraction than aluminium and I think polycarbonate. This can have the effect of fractionally pulling the optics out of perfect alignment in extreme weather conditions and is obviously something worth avoiding. 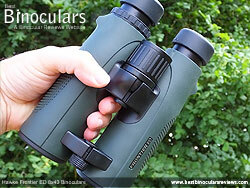 Whilst I did not test the validity, the Hawke Frontier ED X binoculars are advertised as being fully waterproof. Remember being fully sealed also prevents dust for being able to enter in dry conditions and so is important even if you never go out in the rain. They are also "nitrogen purged". This means that all the internal air is replaced with nitrogen at the factory. This moistureless gas defends against moisture forming on the internal glass lenses and thus are fogproof as well. The eye-cups have a real look and feel of quality to them and this certainly an area where the ED X is better than the older version of the Frontier. Indeed they remind me a lot of those that you get on instruments like the Swarovski EL 8.5x42, which are truly excellent. The rubber cover fits very tightly onto the housing and the twist-up action is extremely smooth and has just enough resistance to prevent unwanted movement. Another aspect that is noticeable is that there is zero wobbling and no free-play that I often see on lesser products. The twist up mechanism has a single click-stop position midway between fully retracted and extended (see right eyecup on image above). The 18mm of eye-relief is excellent, which will please those who use some sort of eye-wear. As this is the area on a binocular that most often gets damaged should you accidentally drop them, it is also important to note that the eyepiece housing is metallic and not plastic like many others out there. Also, like the best ones, they can also be unscrewed and thus easily removed and replaced should the need ever arise. The focus wheel on the Hawke Frontier ED X 8x42 binoculars is a real cracker, another improvement on the older version and I feel up there with the very best. 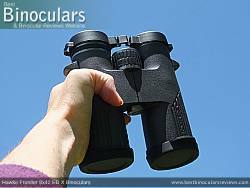 The metal shell combined with the twin rubber tracks not only looks great, but provides a good level of grip which can be important if you use your binoculars in winter with gloves on for example. It is well placed and measuring 31mm in diameter, it is also fairly large and thus easy to reach, even if you have small hands like that of my wife (see the image below). The action of the wheel is also perfectly smooth and has just the right amount of resistance so that it does not turn too easily or require too much force. The gearing is such that it takes just about 1¼ turns to move the focus from one extreme to the other. In terms of aggressiveness this means they occupy the middle ground and thus offers a good compromise between the speed at which you can make large focal adjustments and how easy it is to fine tune the focus. 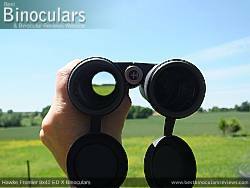 Dioptic adjustments are made by turning the wheel located in the standard position on the right eyepiece. This allows for fine-tuning of the focus of the right side of the binocular independent of the left and thus you can calibrate then to allow for any difference in vision between your left and right eyes. The rubber-track on the diopter is discreet enough so that you are not likely to move it by accident, but at the same time is also effective in terms of grip for when you need to make adjustments. However having said that and whilst there is a good level of resistance, I would have preferred to have one which is lockable so as to completely eliminate the chance of that occurring. 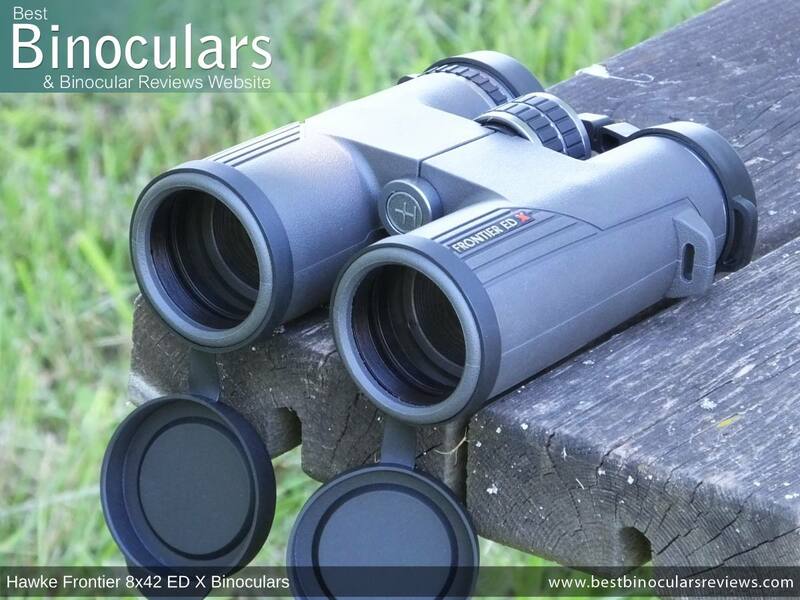 As you can see from the comparison table below, weighing in at 692g / 24.4oz, these Hawke Frontier ED X Binoculars rank amongst the most lightweight 8x42 binoculars that have a magnesium chassis. This is impressive in itself, however when you consider that they also have a metallic focus wheel and eyepiece housings, then this is even more so. They are also weigh considerably less than the previous version (26.2ozs / 743g). As is the standard, the publicized dimensions of these Hawke binoculars are taken with the eye-cups twisted in and the hinge fully open. As you can in the above table, they are fairly compact for a 42mm binocular and an inch shorter than the old Frontier ED. 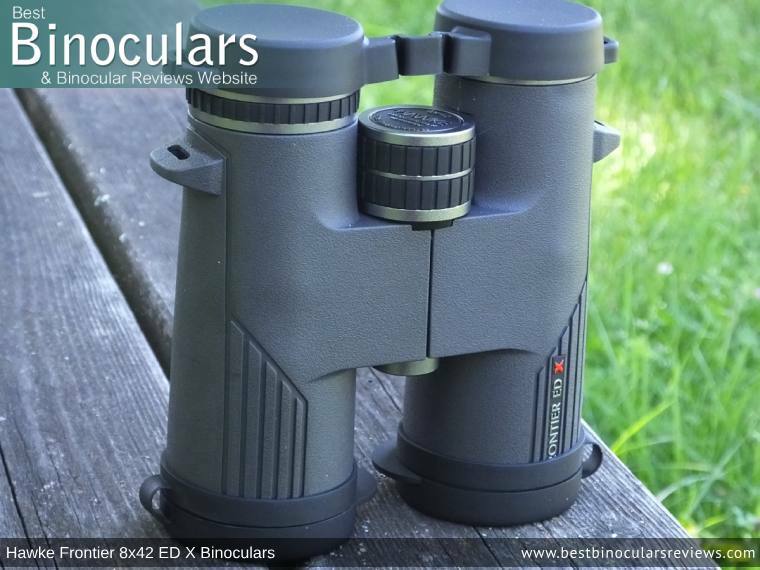 The single hinge that spans the two barrels on these Hawke 8x42 binoculars is just under 4cm wide and almost positioned at an equidistant between the ocular and objective lenses. It feels robust and opens and closes smoothly, but with just enough resistance to ensure they remain at your desired setting. Speaking of which, by opening and closing the hinge you can move the eyecups either closer of further apart so as to match the distance in between your eyes. 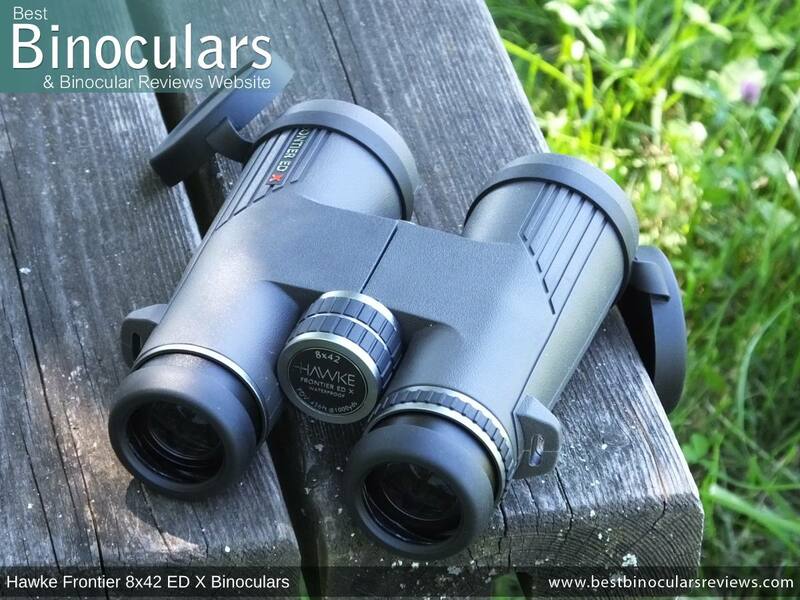 This IPD (Inter-Pupillary Distance) range on these Hawke binoculars is from 5.6cm up to 7.4cm which for a 42mm roof prism binocular is pretty normal. The series of Hawke Frontier binoculars are all "tripod adaptable" what this means is that a regular tripod adapter can easily be fixed to them by unscrewing the cap on the front of the hinge that separates the two barrels. Whilst Hawke Optics do not supply any information as to the exact arrangement of the lenses in their eyepieces, I can say that I measured the outer ocular lens to be 22mm in diameter, which is pretty large on a binocular of this size. As well as making it easier to line your eyes up in the correct place, having a large ocular lens offers up a number of potential advantages including improved image resolution. See more on this here: Binocular ocular lens size. 42mm in diameter, the objective lenses are positioned a full 10mm back from the ends of the barrels. Whilst this does mean that the body could have been a little shorter had Hawke chosen to place them less deeply, the main advantage of doing this is that it offers a great deal of protection and shelter to the glass. This is both from physical damage and preventing things like dust or rain from settling on the lenses. Another advantage of deeply set lenses is the overhang acts like a lens hood on a camera which helps reduce lens flair in certain situations depending on the direction of the light. As their name suggests, the lenses in these Hawke Frontier ED X binoculars also contain elements made from ED (extra-low dispersion ) glass. This glass offers the optical designer more freedom and control to better direct the wavelengths of light as they split up going through the lens. This means that a well designed optical system with ED glass in the lenses has the potential to improve image quality by reducing chromatic aberrations even more than those that use standard low dispersion glass. Reducing these particular aberrations has the visual effect of reducing the amount of color fringing that you can sometimes see around the edges of objects when looking through your instrument. 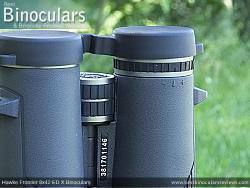 These and indeed all the Hawke Frontier binoculars use roof prisms to correct the inverted image. I can also confirm that these prisms are made from BaK-4 glass which is good. 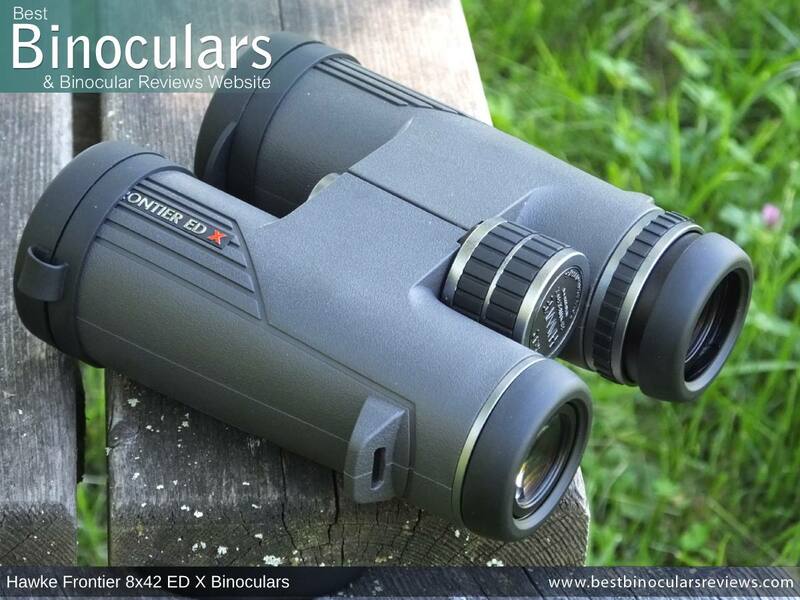 The Hawke Frontier 8x42 ED X Binoculars are Fully Multi-Coated, which indicates to us that every lens element throughout the system has been treated with multiple layers of an anti-reflection material, which really does make a noticeable difference to both the quality and brightness of the image. 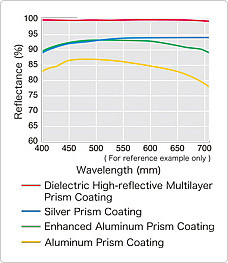 This exact wording here is important to note of as many will highlight that they are Fully Coated or Multi-Coated, but this only means that either all lens surfaces have been single coated or only some of the lens surfaces have been multi-coated, which is cheaper to do, but far less effective. 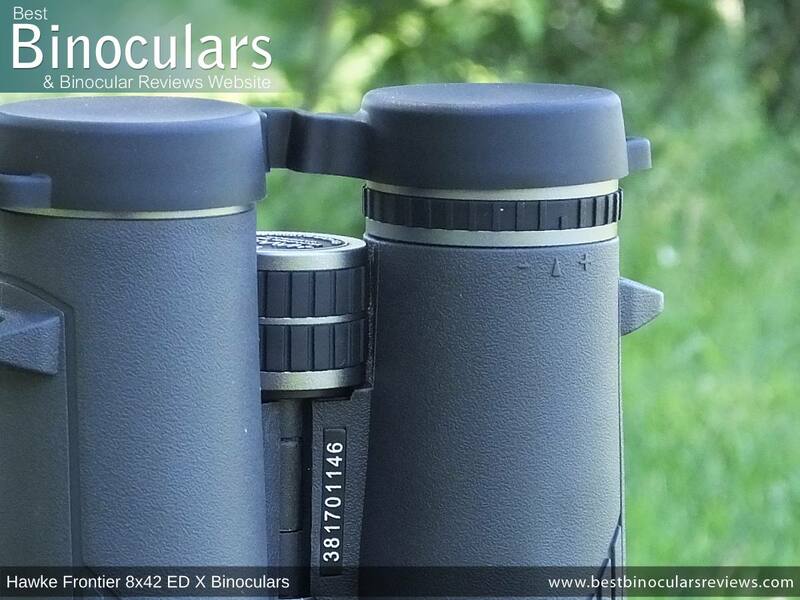 The roof prisms on the Hawke Frontier ED X binoculars are dielectrically coated which is great news as with a light reflectance level of over 99%, this is as good as it gets and certainly aids both the quality and brightness of the view. 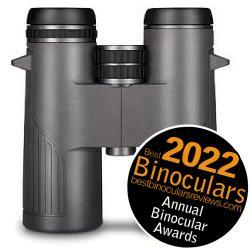 Many binoculars in this price level will use a cheaper silver mirror coating instead, which has a reflectivity of between 95% to 98%, which is good, but not not quite up there with dielectric coatings. As well as this, Hawke have also added phase correction coatings to the surface of the prism on the Frontier ED X. These counter a phenomenon known as phase shift that occurs when light passes through a roof prism. The result is an image with a higher resolution and better contrast than those left untreated. As well as being deeply set, the outer surface of the objective lenses also have coatings of a water repellent material added to them. Thus if rain does get onto them, it simply rolls which helps maintain a great view even in really bad weather. These coatings also reduces water stains and other marks that can form on the lenses and thus keeps them cleaner for longer, which means less frequent cleaning is required. On top of this it also means that when you do have to clean them, you often have to apply less force, which in turn means that you are less likely to mark or scratch the glass. These 8x42 Hawke Frontier ED X produce a view that when measured at a distance of 1000 yards away is 426ft wide. Or to put it in metric terms, is 142 meters wide at a distance of 1000 meters. 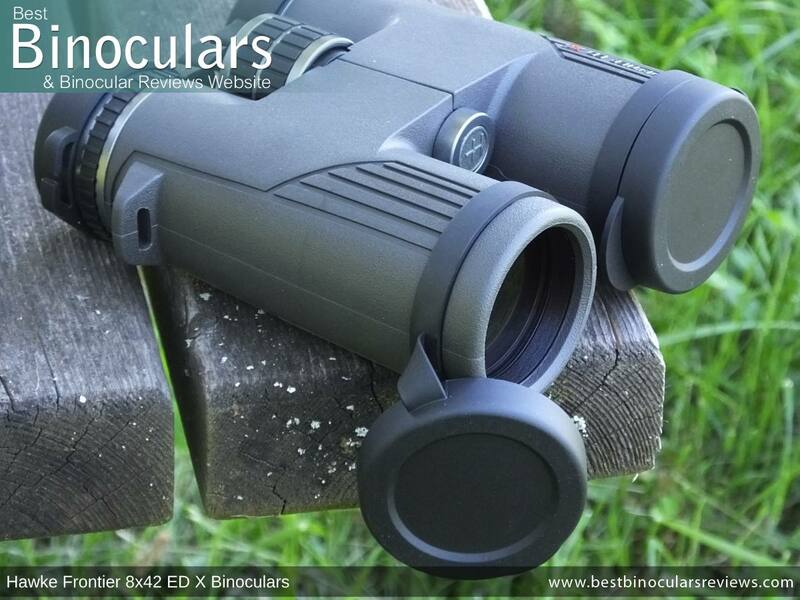 As you can clearly see in the comparison table below this field of view this is excellent and ranks up there with the very widest 8x42 binoculars that I have ever used and sits comfortably amongst the widest 8x42's currently on the market. 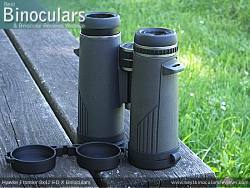 Thus they also are certainly what I would describe as a wide angle binocular. Also interesting to note that this very wide FOV is the same as the older 8x43 Frontier ED. 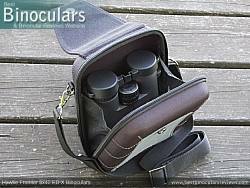 Measuring in 18mm, the length of eye-relief is excellent and certainly what I would describe as having a long eye-relief and thus when combined with their fantastic quality eye-cups certainly are a good option for users who want/need to use their binoculars whilst wearing some sort of eye-wear. Note: Once again this measurement is the same as which was available on the older version. With an advertised distance of 2m / 6.6ft, the minimum close focus distance for an 8x42 binocular is extremely good and once again exactly the same as the previous model. Also worth noting that I measured the closest distance that i could focus on an object and I found the figure of 2 meters to be spot on. 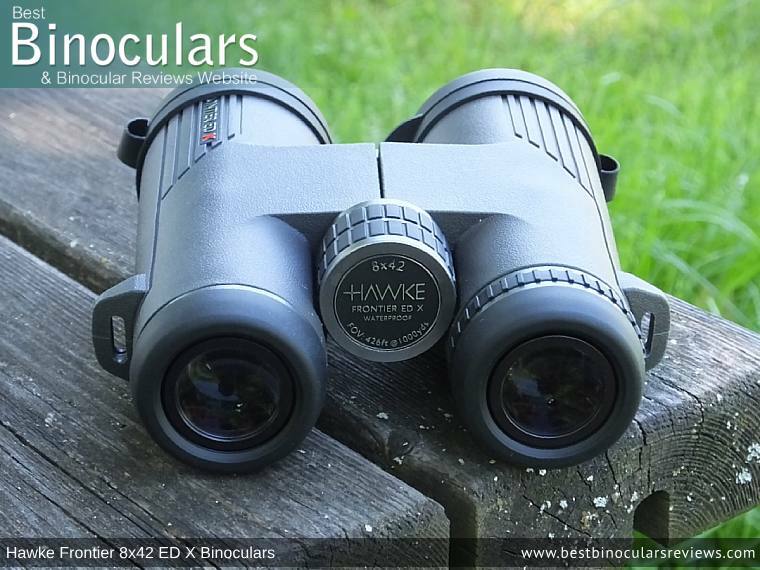 Due to the fact that what you see through a binocular is so subjective, your perception can change over time and quite often the differences between instruments (especially higher quality ones like these Hawk's) is so small I find this by far the hardest part of my review to write. 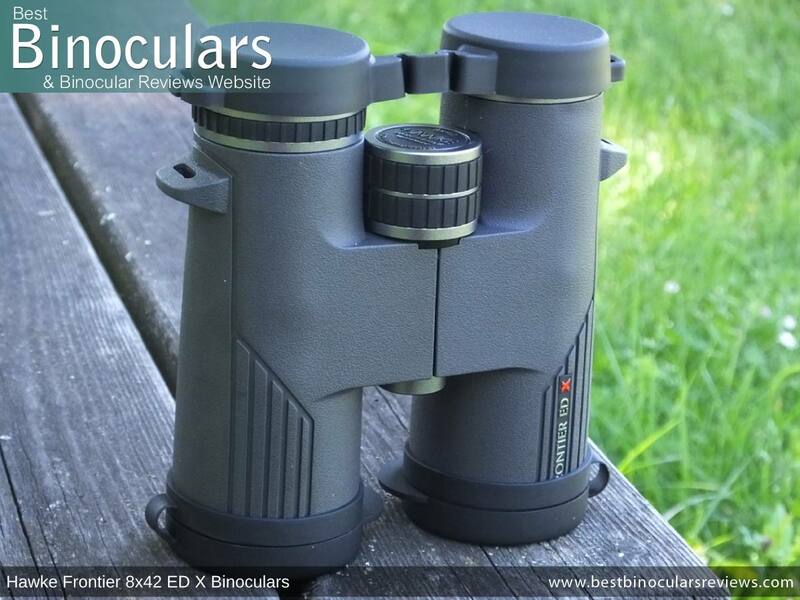 When compared to my alpha 8x42 benchmark binoculars the view to me looked to be equally as bright in good light conditions and I would say, whilst very minor they do seem to be less dull than the mid range benchmark. In low light, the improvement in brightness between these and my mid range 8x42's was more pronounced as this is where the higher levels of light transmission as a result of better coatings on the prisms and lenses really shows their worth. Interestingly, I really could not say that I could perceive a marked difference between these and my alpha's, which leads me to say than at this price level this is about as good as you could ever hope to get. I could not observe any sort of tinting to the image and to me the colors were vibrant, but at the same time neutral. This is a good thing as sometimes an image can have a green or even reddish hue, or the colors can be overly vibrant making the view look somewhat artificial. 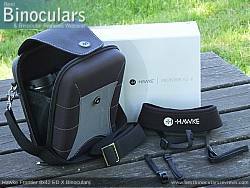 None of these scenarios are the case with the Hawke binoculars. Likewise, I thought that the level of contrast in varying light conditions and when viewing different objects with different levels of brightness and reflectivity (e.g. thick bushes versus a well lit wall of my house) looked perfectly normal. Once again this is good as there are occasions when a binocular can seem to produce a washed out view or one that just feels flat. Another definite highlight on these Hawke Frontier binoculars is the extremely low level of color fringing that I observed. Even when trying my utmost, by focusing on a dark telephone cable against a very bright lit sky in the background, the thin line of fringing along the edge was very minimal and easily a match for my alpha 8x42. At no time whilst this testing or during regular use of these Hawke Frontier 8x42 binoculars did I ever become aware of any irregular distortions within the image. The blurring that you can see at the edges of just about any binocular you look through was also of a extremely minimal level and about as good as it gets in my experience, so absolutely no issues here. So in summation, I would say that in terms of the view, these Hawke Frontier 8x42 ED X binoculars are truly excellent and easily amongst the very best 8x42 binoculars that I have used at this price range and even a match for many top end instruments. 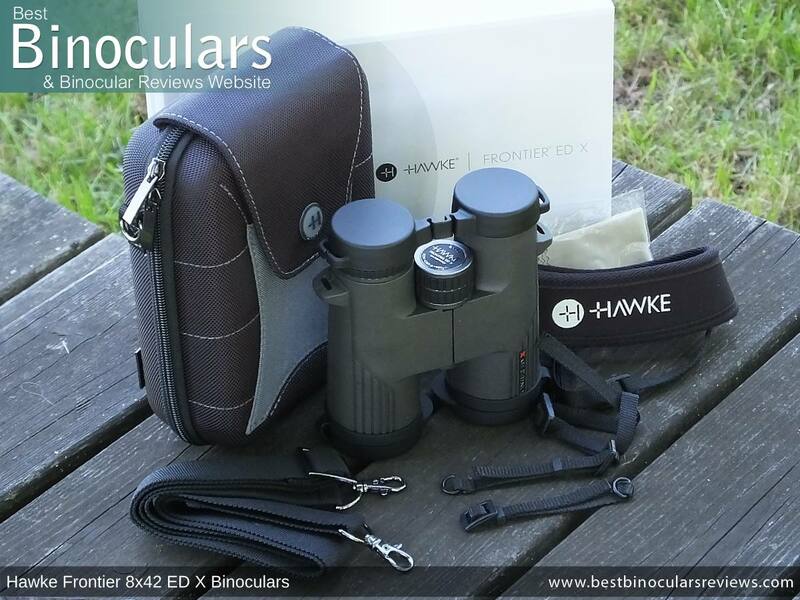 Whilst these Hawke Frontier 8x42 ED X Binoculars come with the usual assortment of accessories, that includes a carry case, neck strap, lens covers and cleaning cloth, there is nothing ordinary about them. Firstly there is that fact that rather than the usual soft case, the case you get with these Hawke Frontier ED X binoculars is of a rigid design, which not only looks great, is of excellent quality, but most certainly offers a much better level of protection to the instrument inside. Access to the interior is brilliantly thought out as there is both a full length Zip and a flip over flap that can be fastened via a magnetic clip. At first this may all seem excessive. But think about it for a moment: For a completely secure storage solution, you would fully close the Zip. Then when out in the field and when you need quick as well as a silent access to your binoculars, you leave the Zip open and simply use the clip. On top of this there are a couple of netted restrainers on the sides to prevent the case from fully opening and thus potentially allowing your binoculars to fall out when you open the lid. The binoculars themselves fit snugly inside, but with some room to spare. This makes them easy to replace and take out and leaves enough room to include the neckstrap and leave the eye-cups fully extended, but at the same time is not so loose so that they flop about. This case also comes with it's own fantastic quality carry strap that can be very easily attached ad removed via the pivoted quick release clips. On the rear there is a belt loop as well as an extra pocket. This is quite tight, so would suit storing things like money and perhaps a small set of keys. Another excellent accessory is the neck strap. It is nice and thick and well padded, it also is curved to better fit around your neck and shoulders. It also has a separate set of connectors with a loop on it. 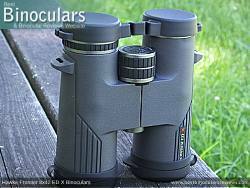 This you fix to the binocular in the normal way using a slider and then attach to the main neck strap. 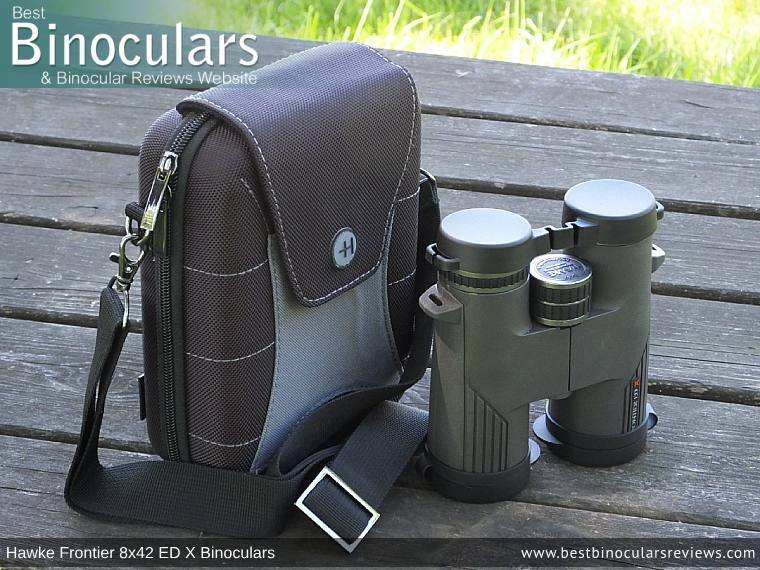 This adds a pivot section onto the strap that works well as you bring the binocular up to your eyes, giving you just a little more freedom of movement. It also makes it easier for you to swap between a harness and the neck strap. I guess my only comment here would be is that I personally would have preferred it if they had used a quick-release clip rather than the sliders to make this task even easier and quicker. In contrast to the well above average the case and neck strap, both the lens covers and the rain-guard are fairly typical. They fit and perform their function well, but are pretty generic and lack any flair or branding. The cleaning cloth is also fairly basic, fine for using on the body and perhaps in emergency when out in the field. But for thorough cleaning of the lenses I certainly suggest making the relatively small investment in an optic lens cleaning kit. Another important aspect to this pair of optics is the fact that Hawke Optics offers a lifetime warranty against defects in materials and workmanship for the original owner. Note, in the UK and Europe this is restricted to 10 years by law. 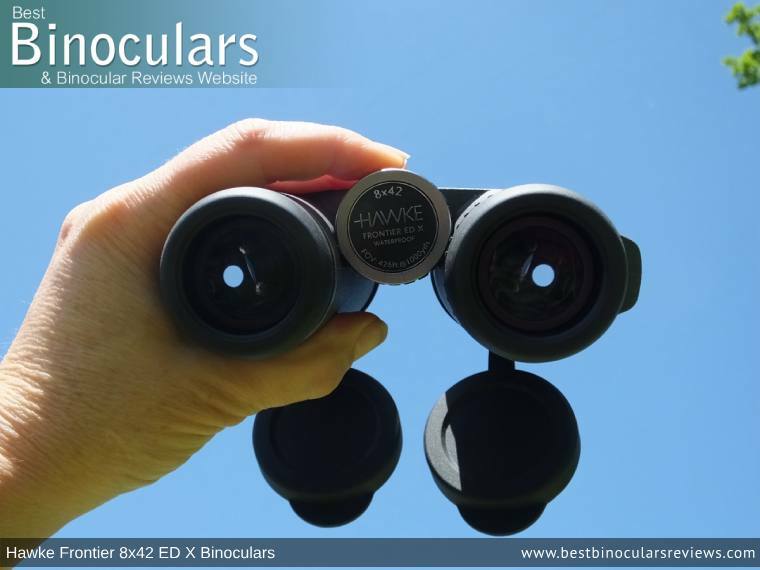 You can compare some of the details of this binocular against a small selection of other Mid to High Priced 8x42 binoculars in the BBR database. 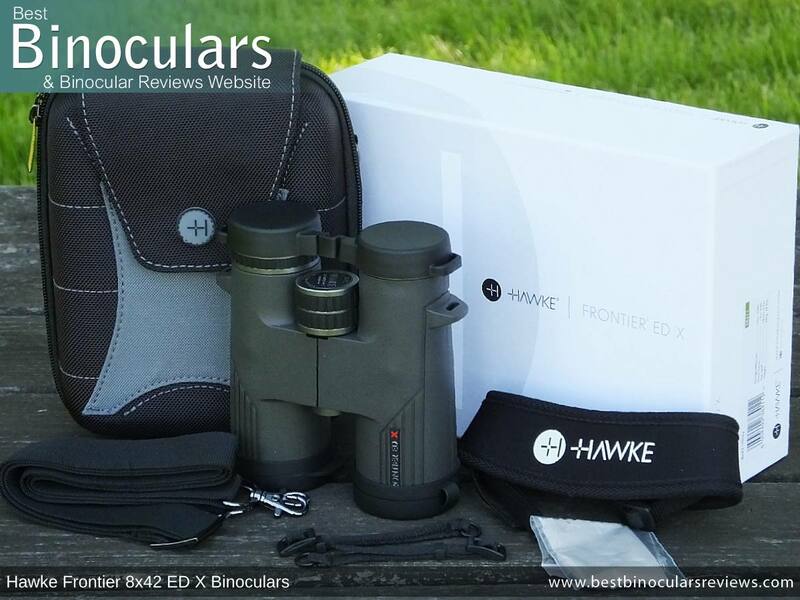 These are a truly great pair of binoculars and within their mid-to-high end price category, these Hawke Frontier 8x42 ED X Binoculars really do rank amongst the very best that I have ever come across and I have to say are a firm favorite of mine. Against more expensive, high end and alpha type binoculars they more than hold their own in many areas, especially the most important ones like the view and overall quality. However to keep costs down Hawke obviously have to make some compromises and they have been very wise about this by making these in non essential areas. So for example, there are a few small details like not having a lockable diopter, or the fact that the cleaning cloth and lens covers are fairly simple and generic where they lack. Another point to mention is that whilst the previous Hawke Frontier ED 8x43 binoculars were good, these is no doubt that this version offers a number of important improvements and goes well beyond simple cosmetic changes that some brands make when updating a series. 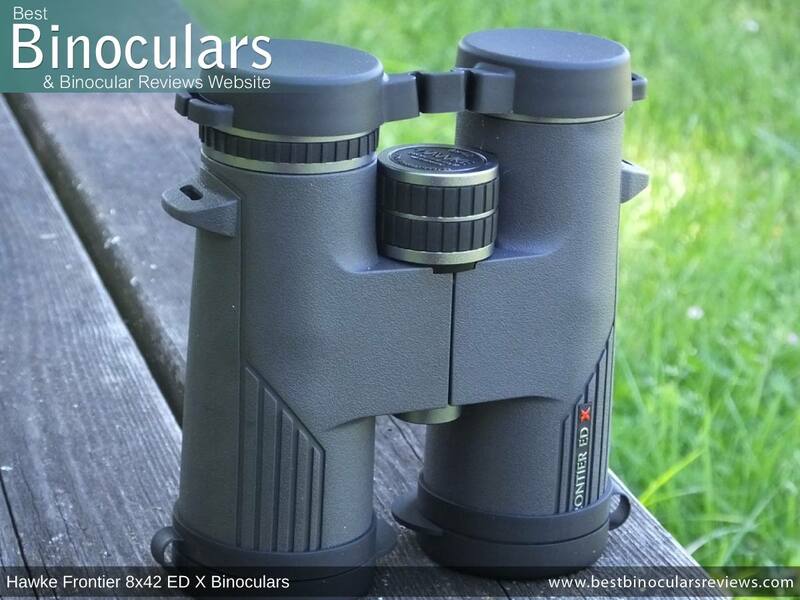 Excellent build quality using high quality materials - good examples of this are is the magnesium frame, metal eyepieces and focus wheel, etc. Extremely wide view, good close focus and ample eye relief. Lens covers, rainguard and cleaning cloth are not at the same level as the rest of the accessories and the instrument itself. Very minor point, but quick release clips on the neck strap would make it even easier to take it off and swap with a harness.